On this sheet the motions of birds are frozen mid-air thanks to the quickness of Leonardo’s eye. 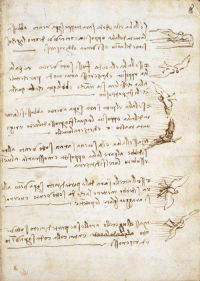 The birds are sketched on the right encountering wind from various directions, while their actions are described on the left in Leonardo’s characteristic mirror writing. Strangely, he remained unaware of how they actually propelled themselves through the air. Leonardo proposed to establish a “science of the winds…by means of the movements of water”. Following the same analogy, swimming might lead to the discovery of the secrets of flight. Write of swimming under water and you will have the flight of birds through the air. A bird is an instrument operating through mechanical laws, which instrument it is in the capacity of man to be able to make with all its motions. As suggested by the name, this manuscript deals primarily with the flight of birds, which Leonardo analysed closely in his efforts to build a mechanical flying machine. Here the mechanics of flight, air resistance and the effects of wind on the wings and flight of birds are all considered in great detail. This codex consists of 13 pages out of an original 18 and was originally part of Manuscript B.